US Opening-inwards Double French Doors are extremely weak and generally will not withstand an aggressive attack or kick-in. Double French Doors are the most vulnerable of all doors mainly because there is little support in the centre of the door where the two doors meet and may contain vulnerable locks. The screws used to support the hinges and the strike plate are very short. Also normally the glass is vulnerable to attack. 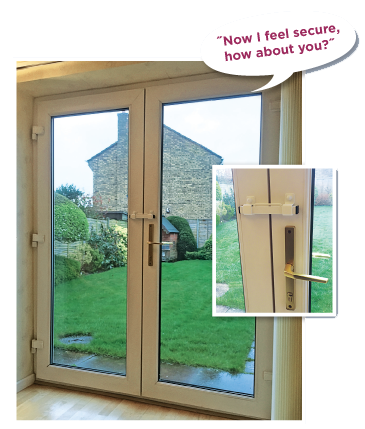 As a result criminals target Double French Doors in occupied and unoccupied homes and these attacks can potentially create the most dangerous of incidents for residents. Existing doors can be replaced with doors containing strong security including better locks and security glass but are expensive. However, in three brief steps we show you here how your existing Double French Doors can be transformed to secure doors, at a fraction of the cost of replacing your doors. Install the Burglarybuster 3. This amazing device both reinforces the door to block kick-ins and also prevents the door from being opened from outside even when existing locks have been opened by criminals. 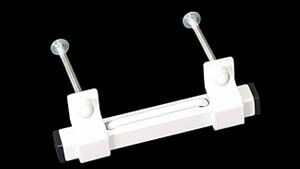 Now US market leader, this unique product is the strongest locking device available for securing French Double Doors. This is mainly because of the special fixing method used whereby a ¼˝ thick Carriage Bolt is inserted into the entire thickness of each of the two inward-opening doors, to support the two brackets that hold the box section (channel) in place. Picture shows the 2 x Carriage Bolts with mushroom heads. This fixing method provides the highest level of strength possible. b) Prevents unlocked doors from being opened from outside. c) When main locks have been overpowered, prevents the door from being opened from outside. Remove and check the size of the screws used to support the hinges and the strike plate in the door frame and if necessary replace them with 3˝ screws. If available locally additional hinge and strike plate reinforcement is worth considering. To avoid the breaking of glass to gain entry replace existing glass contained in your Double French Door with a minimum of ¼˝ thick laminated glass or alternatively apply 3M security window film to the glass on the inside of the door. Now I feel secure how about you? Opening-inward Double French Door transformed to secure door now containing the Burglarybuster 3 (White), ¼˝ thick laminated secure glass and 3˝ long replacement screws in all hinges and the strike plate. Sash jammers should never be used to reinforce French Doors because the support fixings used will give way when subjected to a strong attack. Reinforces the door and acts as a last line of defence even when existing locks have been by-passed. Simplicity of operation makes it the ideal solution for seniors. Home Safety: Easy removal of the U Pin releases the lock and allows immediate emergency escape for residents.